For the first episode, we’re looking into a very special product: Trello. Wondering how they did that? From the start, Trello’s team dreamed of a product that 100 million people can use. While setting that big hairy audacious goal, they figured that there’s no product 100 million people will pay for… so they opted for a freemium model. Their take: if only 1% of the 100 million people pays them $100 per year, they still end up with a $100 million business. 🤑 The other 99% of the user base drive the marketing of the app to new people. They set out to make their app super easy to start and keep using it. They made a horizontal solution for all humans, not focused on any group or application in particular. Recognizable concepts and zero learning curve. The software is built to match a metaphor that everyone gets: post-its or cards on boards. It’s just like sticking post-its to your fridge or to the office wall. To avoid complexity and any learning curve, the app deliberately avoids abstract concepts. No brainfarts. Trello instead allows you to create columns of cards, which makes organizing your things much more tangible. The team understands that an app’s features can be copied, but emotions and feelings surrounding an app can not be. Trello’s color, the husky dog, the tactile nature of dragging the cards… are all aspects Trello has spent an inordinate amount of time on to optimize them. Now, easy and fun is cool, but what if you are looking for something a bit more advanced and specific? To solve this, the Trello team decided to offer power-ups. ⚡ These are advanced features that you can turn on and off selectively. If you want to build a tool that 100 million people can use, you can’t just build for developers, sales people, or recruiters. 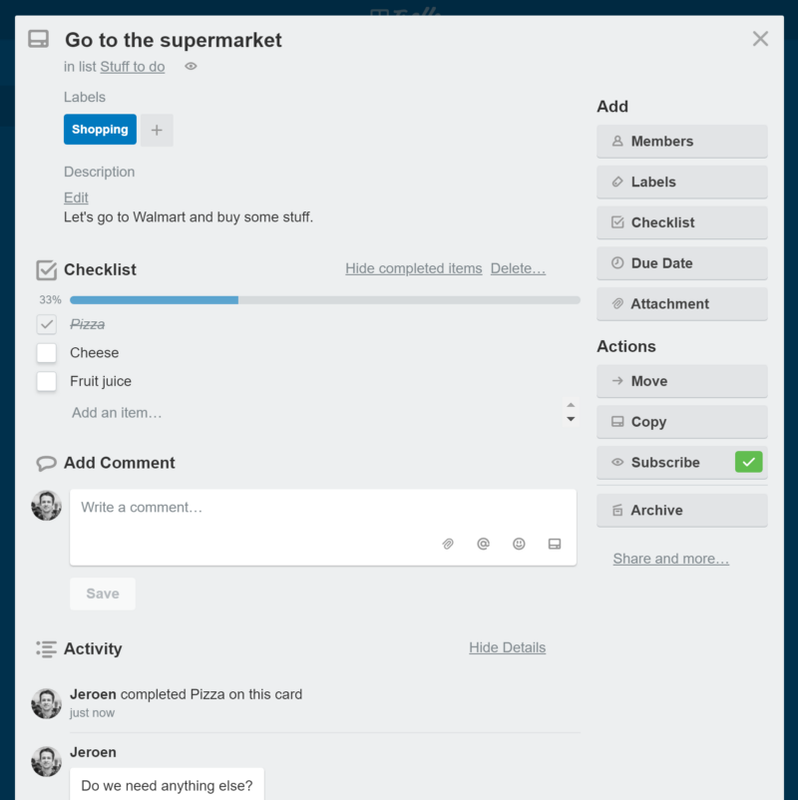 Trello gives structure to any process you’re working on. It’s agnostic about data structure and content, much like a grid in Excel, a document in Word, or slides in PowerPoint. All these apps match a real life concept that leaves a lot of space for creative use. This however implied that Trello was a to do list. This limited Trello’s potential. The team therefore decided to remove these column names again. Also, the early adopters of Trello were mainly developers. The team had to ignore many feature requests that were aimed at facilitating the development process. The Trello team doesn’t consider users good product designers who should come up with new features themselves. Instead they choose to really listen to their users and ask questions to find out how they can solve their problems in the best way. Like a doctor making a diagnosis. Trello got some early eyeballs as it was founded by the founders of StackOverflow and FogBugz. Then they got a push from an early Life Hacker article, were featured at TechCrunch Disrupt, … but, from there on, most of the growth has been organic. They have never done any real advertising. When people get others to try Trello, the next step is turning that word of mouth into active user growth. 📈 Getting people to really use Trello through a seamless onboarding experience. Onboarding people who join an existing Trello board proves to be relatively easy. They enter a place that is active already. For the others, “empty board syndrome” is a real issue. Trello therefore focuses on writing lots of content to inspire new users. They also create sample boards that showcase the app’s endless possibilities. Mind that, for Trello, sample boards are not meant as templates. They are for inspiration, not to use as a starting point. Templates don’t make much sense in Trello’s case, as people only need to name a few columns to get started. Changing a sample board is most often more work intensive than creating a new board. When used in a team, Trello is as much a communication tool as it is a planning tool. This doesn’t only make people invite others. It also keeps people active on Trello. While I mentioned above that Trello internationalized their product and marketing and made it available in 20+ languages, they didn’t do this from the start. True, merely translating an app is not a lot of work. But it adds complexity and slows down the organization along the way. They therefore only focused on localization as soon as it started making sense in the growth trajectory of the company. I tell people when they join our company: our mission is to Mars. We’re passing the Moon right now, but it’s a long way. It’s like 4 days to get to the moon and 4 months to get to Mars. We’re not sitting on the launch pad, we’re just taking off. There’s a lot of risk that’s been removed but there’s so many things and low hanging fruit we need to go after.